Big Brother Over The Top started two days ago. However, the competition doesn’t really begin until after the BBOTT head of household takes his or her crown. Once we have an HOH Big Brother Over the Top winner, we start to see alliances and power duos forming. We saw a few of them begin to form late last night and early this morning in the Big Brother Over the Top house. Already, three very distinct alliances have begun to form in the Big Brother Over the Top house. Starting night one, Shane Chapman, Monte Massongill, Cornbread, and Scott Dennis formed a four person alliance (which may or may not be called the Four Horsemen). They discussed a few targets, including Kryssie Ridolfi, Neeley Jackson, and Jason Roy. They eventually settled on Jason as their week 1 target. They then pulled Alex Willett in on their alliance, and asked her to work on Whitney Hogg and Morgan Willett. So we have a four person all-male alliance. Then we have a three person female alliance forming with Morgan, Alex, and Whitney. The three girls and four guys alliance seems to want to work together this week but it might eventually switch. Last night, Kryssie, Jason, Shelby Stockton, Justin Duncan, and Scott spent long hours just getting to know each other and talking about their housemates. Around 3:50 am BBT on 9/30/16, the talk turned to strategy. They discussed who to target to protect themselves and each other. They also discussed ways to infiltrate the other groups. They talked about Shelby budding up to Whitney, Morgan, and Alex. They mentioned Justin continuing to seem non-threatening by hanging in the kitchen. They want Scott to play doubt agent. Kryssie is just supposed to float around to groups, and Jason stays Jason. The current five person alliance was also discussing maybe pulling Neeley into their group to make it a strong six. However, Neeley would be on the out and only used as a number. They also considered adding Danielle Lickey too, but thought her budding showmance/flirtmance with Shane might make her not trustworthy or loyal to them. However, Jason felt confident that he could still keep her semi-close to him, and bring her to their side. They called themselves the OTTJamboree. Unfortunately, the Jamboree formed a bit too late to really have power this week. Jason is the only member of the group not infected yet (so still in the HOH comp). However, he will be soon. The Jamboree discussed targeting Cornbread, if they gain power. They want to target him, Shane, and Monte. Likely, Monte will gain power this week, which doesn’t look good for the Jamboree. However, Scott is actually a double agent, so we have no clue who he is more loyal to yet. He did speak to Shane a little earlier today, and told him some information discussed last night. However, he did try to protect the Jamboree by taking the target a little off Jason. 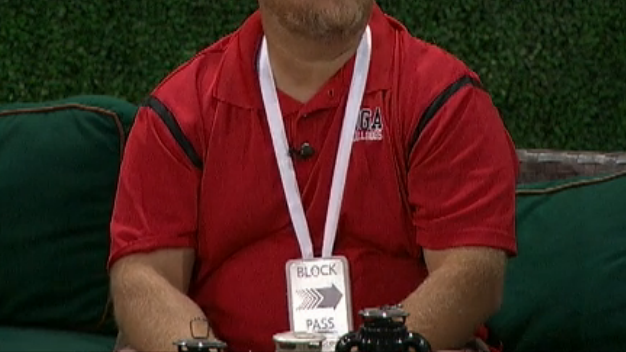 Scott maybe the only thing that can save this alliance. The Big Brother third nominee also might work in the Jamboree’s favor as long as they have enough votes. 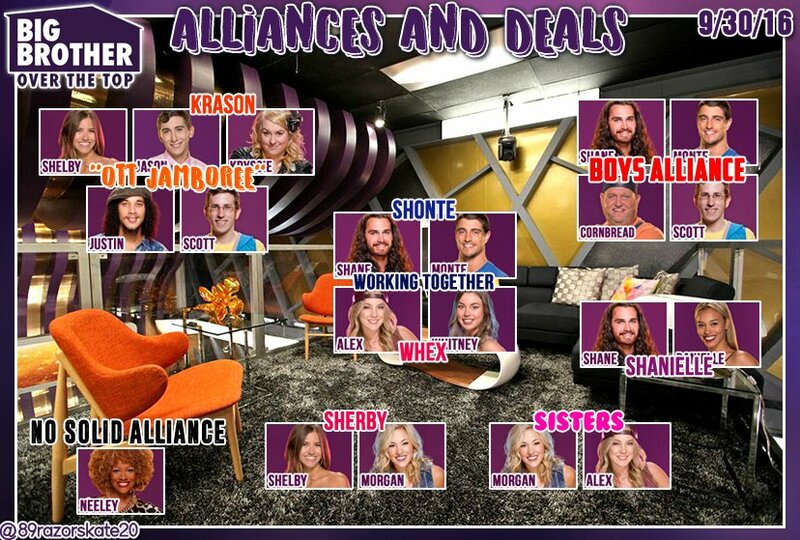 What do you think of the newest Big Brother Over the Top alliances? Jason has diarrhea of the mouth. His constant yakking is getting on my nerves. He may win simply by talking everyone to death. Frankly, i hope he gets evicted first. If not first, then SOON! I know. I want to like him. He is entertaining. But he does NOT stop talking! And … he talks mostly about himself. Again, I think this is a demonstration of his insecurities. It is odd that they put him in the house as an obvious vet with no protection whatsoever. Maybe they thought he could talk his way into some protection for a few weeks…? His alliance is operating under the misconception that America loves him so therefore he will receive “voting” prizes. I don’t think he has revealed that the other person up for reentry was one of most disliked hgs of all time so not an enormous feat to win his way back in. Plus, since he has been in the game before, he can help them go further. Both of these things are not true. BBOTT is a whole new ballgame. What “was” is not what “is”. Lord love a duck, i hate it when they bring players back!! If he does go first, it will be nice to have that element completely out of the game. …….and here I am again at work with no access to my feeds!!! ughh. Still haven’t had the chance to watch any of it. As you ladies know I am a Jason fan by default..(fellow MassHole) LOL it was the same problem in his season….slow your roll Jason and give your lips a rest! Damn it he’s going to get himself booted. Who knows maybe when I watch it later I will be cheering for him to go! Have to give my input after I watch it. Going to get some work done now. Check you ladies out in a day or so. I seriously think this is a stupid way for choosing noms. I don’t think TPTB thought this thing through. It seems every comp/ceremony will be a long drawn out process. Not exactly what i was expecting. I’m open to a basically different BB. My biggest problem is finding a way of following the show without staring at the feeds on my computer for 80% of my life! A good way is to watch the recaps, and also monitor some of those sites that do blow by blow recaps, or just BBN’s feeds highlights, then rewind to anything interesting. I agree about the snail pace. I use the app to watch the feeds too, and I was having a lot of issues watching the safety ceremony last night because it kept freezing. Just had to give up, and plan to rewind later. 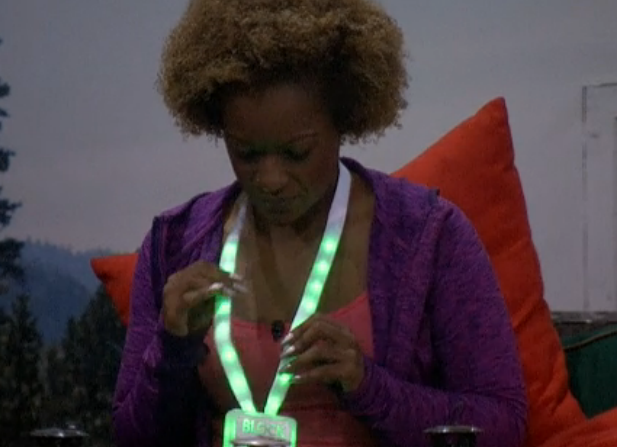 I think i’m frustrated by the HOH taking 2 days and the Safety Ceremony taking 2 days. It just seems to be moving at a snails pace. With LOTS of talking and talking and talking while we wait. Don’t mind me, i’m still shell shocked from BB18. Yea, Cat, I feel your pain. This season is designed to keep viewers watching, whereas the tv show was a milemarker by which the hgs and fans watched the feeds. Now, you almost have to watch 24/7 to feel like you’re watching the show! I don’t mind the 100% online. I don’t even mind the stretched out comps (at least some of them). But they need to have a set schedule for the show. The combination of this fluidity of events COMBINED with the changes to the comps (making them longer and different) is too much change. Unless you’re a 20-year-old college dropout who watches almost 24/7 – between gaming. If I have to read spoilers to glean 80% of the show’s content, why watch at all? Still giving it a stab, though. Willing to admit I will adjust after they get some of the content to watch on demand on the feed access.